If you are continually fighting the weight loss war and your ‘battle cry’ in the past has been “I need to lose weight” then you need to change up your slogan to “I need to get healthy to lose weight” and motivation is the first element that you need in place if you are serious about sticking to a healthy eating and exercise program. you must address your mind/mental aspects before you will see results on your physical frame. It’s no surprise that we’re screwed up about weight loss. Every time we turn on the television, there is a new program showcasing a popular new diet or better said…a new diet fad because that’s what they are. However, the advertising and slick marketing convince us that whatever it is we are watching will work equally as well for us. There is a secret to losing weight and it does not involve the latest fad diet to hit the mainstream. 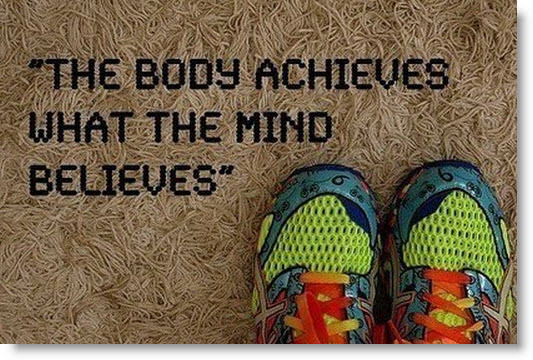 The ‘secret’ for successful weight loss can only be achieved by training the MIND and the body at the same time. They work together to achieve your weight loss goals. The cause of our weight gain is not located on the surface of our bodies but is hidden deep within our subconscious mind. The subconscious mind is your storehouse of thoughts, emotions, feelings and self-beliefs and these are what drive your actions (or inaction) especially decisions about food and exercise. Hidden thought patterns and self-beliefs…some we are not even aware of sabotage our efforts to lose that unwanted, unsightly bulge. Some of these beliefs come from inherited ‘wisdom’ but much is misinformation about nutrition, dieting and what proper exercise is. This type of self-delusion means your inner ‘mind’ templates are working against you rather than for you. Eating the wrong types of foods, too much of them or avoiding exercise are all deeply ingrained patterns that must be changed if you hope to see the effect you want on your body; if you hope to lose that excess weight and KEEP IT OFF. Most likely you will have to dig deeper to identify and change these long-standing attitudes, habits, feelings and assumptions that have influenced and continue to influence your relationship with food. Your overweight problem is being driven by ‘faulty’ inner mind programming that actually leads you to turn to food sometimes. The truth is weight loss can only be achieved from the inside out. It is an inside job. If you are living in an overweight, unhealthy and unhappy body and you wish to change that, you will need to make some serious changes to your ‘inner’ mind programming first. Once your mind is properly programmed into the goal of becoming a slim, fit person living in a healthy, feel-good body you will automatically make decisions that will lead you to it without even having to think about it. That’s when your subconscious works for you. Undoubtedly the single most important thing you can do to lose weight and keep it off is to spend a little time on the ‘inside’ first. If you struggle to lose weight, if your exercise programs and diet programs don’t seem to be working no matter what you do then check out my new course outlining this very problem.